Hyperparameters are adjustable parameters you choose to train a model that govern the training process itself. For example, to train a deep neural network, you decide the number of hidden layers in the network and the number of nodes in each layer prior to training the model. These values usually stay constant during the training process. In deep learning / machine learning scenarios, model performance depends heavily on the hyperparameter values selected. The goal of hyperparameter exploration is to search across various hyperparameter configurations to find a configuration that results in the best performance. Typically, the hyperparameter exploration process is painstakingly manual, given that the search space is vast and evaluation of each configuration can be expensive. Azure Machine Learning allows you to automate hyperparameter exploration in an efficient manner, saving you significant time and resources. You specify the range of hyperparameter values and a maximum number of training runs. The system then automatically launches multiple simultaneous runs with different parameter configurations and finds the configuration that results in the best performance, measured by the metric you choose. Poorly performing training runs are automatically early terminated, reducing wastage of compute resources. These resources are instead used to explore other hyperparameter configurations. Automatically tune hyperparameters by exploring the range of values defined for each hyperparameter. Each hyperparameter can either be discrete or continuous. In this case, batch_size takes on one of the values [16, 32, 64, 128] and number_of_hidden_layers takes on one of the values [1, 2, 3, 4]. This code defines a search space with two parameters - learning_rate and keep_probability. learning_rate has a normal distribution with mean value 10 and a standard deviation of 3. keep_probability has a uniform distribution with a minimum value of 0.05 and a maximum value of 0.1. You can also specify the parameter sampling method to use over the hyperparameter space definition. Azure Machine Learning service supports random sampling, grid sampling, and Bayesian sampling. In random sampling, hyperparameter values are randomly selected from the defined search space. Random sampling allows the search space to include both discrete and continuous hyperparameters. Bayesian sampling is based on the Bayesian optimization algorithm and makes intelligent choices on the hyperparameter values to sample next. It picks the sample based on how the previous samples performed, such that the new sample improves the reported primary metric. When you use Bayesian sampling, the number of concurrent runs has an impact on the effectiveness of the tuning process. Typically, a smaller number of concurrent runs can lead to better sampling convergence, since the smaller degree of parallelism increases the number of runs that benefit from previously completed runs. Bayesian sampling supports only choice and uniform distributions over the search space. Bayesian sampling does not support any early termination policy (See Specify an early termination policy). When using Bayesian parameter sampling, set early_termination_policy = None, or leave off the early_termination_policy parameter. Specify the primary metric you want the hyperparameter tuning experiment to optimize. Each training run is evaluated for the primary metric. Poorly performing runs (where the primary metric does not meet criteria set by the early termination policy) will be terminated. In addition to the primary metric name, you also specify the goal of the optimization - whether to maximize or minimize the primary metric. primary_metric_name: The name of the primary metric to optimize. The name of the primary metric needs to exactly match the name of the metric logged by the training script. See Log metrics for hyperparameter tuning. primary_metric_goal: It can be either PrimaryMetricGoal.MAXIMIZE or PrimaryMetricGoal.MINIMIZE and determines whether the primary metric will be maximized or minimized when evaluating the runs. Optimize the runs to maximize "accuracy". Make sure to log this value in your training script. The training script for your model must log the relevant metrics during model training. When you configure the hyperparameter tuning, you specify the primary metric to use for evaluating run performance. (See Specify a primary metric to optimize.) In your training script, you must log this metric so it is available to the hyperparameter tuning process. The training script calculates the val_accuracy and logs it as "accuracy", which is used as the primary metric. Each time the metric is logged it is received by the hyperparameter tuning service. It is up to the model developer to determine how frequently to report this metric. Terminate poorly performing runs automatically with an early termination policy. Termination reduces wastage of resources and instead uses these resources for exploring other parameter configurations. evaluation_interval: the frequency for applying the policy. Each time the training script logs the primary metric counts as one interval. Thus an evaluation_interval of 1 will apply the policy every time the training script reports the primary metric. An evaluation_interval of 2 will apply the policy every other time the training script reports the primary metric. If not specified, evaluation_interval is set to 1 by default. delay_evaluation: delays the first policy evaluation for a specified number of intervals. It is an optional parameter that allows all configurations to run for an initial minimum number of intervals, avoiding premature termination of training runs. If specified, the policy applies every multiple of evaluation_interval that is greater than or equal to delay_evaluation. Azure Machine Learning service supports the following Early Termination Policies. slack_factor or slack_amount: the slack allowed with respect to the best performing training run. slack_factor specifies the allowable slack as a ratio. slack_amount specifies the allowable slack as an absolute amount, instead of a ratio. For example, consider a Bandit policy being applied at interval 10. Assume that the best performing run at interval 10 reported a primary metric 0.8 with a goal to maximize the primary metric. If the policy was specified with a slack_factor of 0.2, any training runs, whose best metric at interval 10 is less than 0.66 (0.8/(1+slack_factor)) will be terminated. If instead, the policy was specified with a slack_amount of 0.2, any training runs, whose best metric at interval 10 is less than 0.6 (0.8 - slack_amount) will be terminated. evaluation_interval: the frequency for applying the policy (optional parameter). delay_evaluation: delays the first policy evaluation for a specified number of intervals (optional parameter). In this example, the early termination policy is applied at every interval when metrics are reported, starting at evaluation interval 5. Any run whose best metric is less than (1/(1+0.1) or 91% of the best performing run will be terminated. In this example, the early termination policy is applied at every interval starting at evaluation interval 5. A run will be terminated at interval 5 if its best primary metric is worse than the median of the running averages over intervals 1:5 across all training runs. truncation_percentage: the percentage of lowest performing runs to terminate at each evaluation interval. Specify an integer value between 1 and 99. In this example, the early termination policy is applied at every interval starting at evaluation interval 5. A run will be terminated at interval 5, if its performance at interval 5 is in the lowest 20% of performance of all runs at interval 5. If you want all training runs to run to completion, set policy to None. This will have the effect of not applying any early termination policy. If no policy is specified, the hyperparameter tuning service will let all training runs run to completion. If you are looking for a conservative policy that provides savings without terminating promising jobs, you can use a Median Stopping Policy with evaluation_interval 1 and delay_evaluation 5. These are conservative settings, that can provide approximately 25%-35% savings with no loss on primary metric (based on our evaluation data). 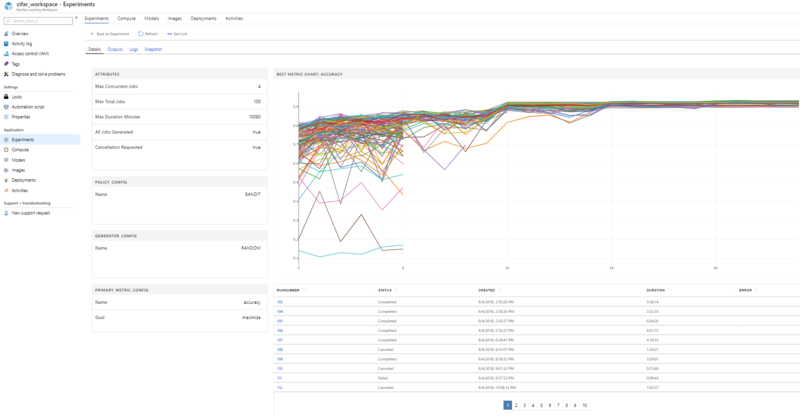 Control your resource budget for your hyperparameter tuning experiment by specifying the maximum total number of training runs. Optionally specify the maximum duration for your hyperparameter tuning experiment. max_total_runs: Maximum total number of training runs that will be created. Upper bound - there may be fewer runs, for instance, if the hyperparameter space is finite and has fewer samples. Must be a number between 1 and 1000.
max_duration_minutes: Maximum duration in minutes of the hyperparameter tuning experiment. Parameter is optional, and if present, any runs that would be running after this duration are automatically canceled. If both max_total_runs and max_duration_minutes are specified, the hyperparameter tuning experiment terminates when the first of these two thresholds is reached. Additionally, specify the maximum number of training runs to run concurrently during your hyperparameter tuning search. 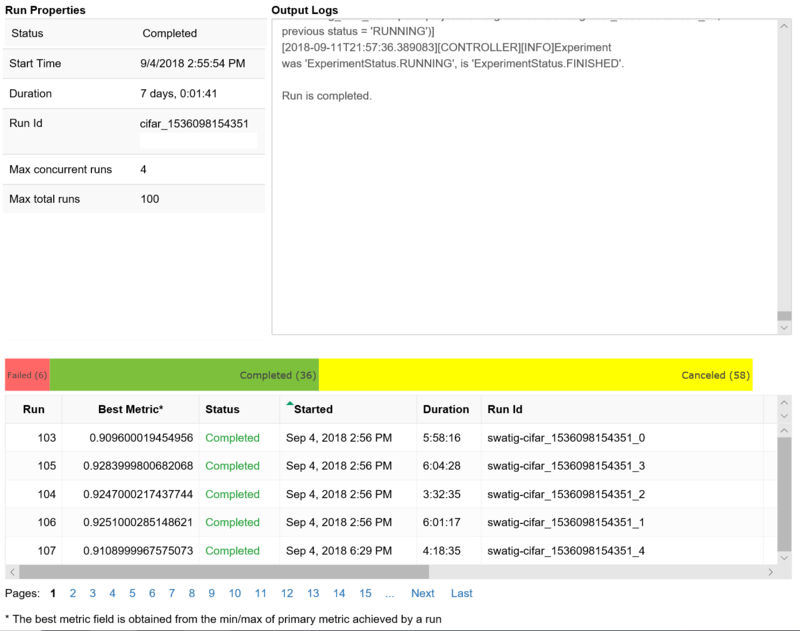 max_concurrent_runs: Maximum number of runs to run concurrently at any given moment. If none specified, all max_total_runs will be launched in parallel. If specified, must be a number between 1 and 100. The number of concurrent runs is gated on the resources available in the specified compute target. Hence, you need to ensure that the compute target has the available resources for the desired concurrency. This code configures the hyperparameter tuning experiment to use a maximum of 20 total runs, running 4 configurations at a time. This code displays a table with details about the training runs for each of the hyperparameter configurations. You can also visualize the performance of each of the runs as training progresses. Additionally, you can visually identify the correlation between performance and values of individual hyperparameters using a Parallel Coordinates Plot. You can visualize all your hyperparameter tuning runs in the Azure web portal as well. For more information on how to view an experiment in the web portal, see how to track experiments. Learn how to run notebooks by following the article, Use Jupyter notebooks to explore this service.